The Leithner family in Ischl, Austria has a long history of fine gunmaking. Thanks to Josef Ahammer and his book Verzeichnis Österreichischer Büchsenmacher we have a good summery of the many generations of that family. Benedikt Leithner- The first of the Leithner family to be recorded as a gun maker, he was born in 1712 and in 1738 married Rosina Aberger. In 1763 at the age of 51 Benedikt became a Büchsenmacher (gun maker). They had a son- Franz Wolfgang Leithner who followed in the trade. Franz Wolfgang Leithner- Born in 1738 he followed in his fathers trade. In 1766 he married Elisabeth Klachl. They had a son-Wolfgang Leithner. Wolfgang Leithner Sr.- Born in 1778, in 1810 he married the gunsmith’s widow Konstanze Schickeneder. Wolfgang Leithner Jr.- Born in 1811 he is recorded as being a gunmaker between 1850 and 1880 but may have been active in the trade much earlier. It appears that he worked with a merchant- Eleonore Ramsauer (who was a supplier to his Majesty Emperor Franz Josef I) to develop the famous “Ischlerstutzen” which was a favorite rifle of the Emeror. The well known “Ischlerstutzen” was a short, large caliber percussion muzzle loading rifle designed for hunting in the Mountains. His trademark became a Gemsbok (male Chamois) of Silver or Gold inlayed into the cheek piece (see one of the following pictures). 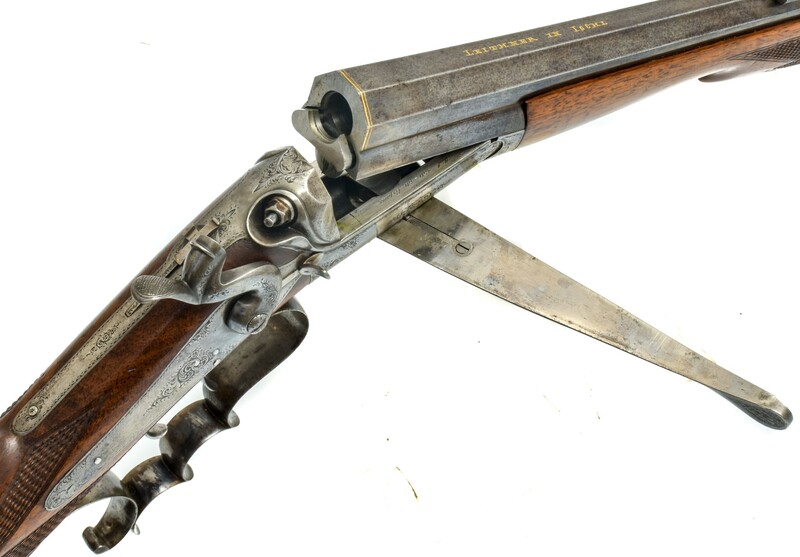 A typical “Ischlerstutzen” made by Wolgang Leithner with the sliding cover patch box, short barrel and harp trigger guard. 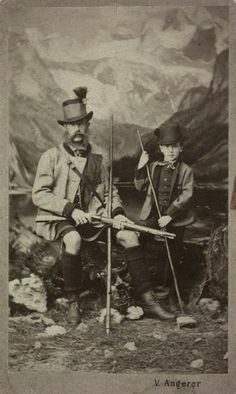 The young Emperor Franz Josef I and his son posing with a “Ischlerstutzen”. Franz Leithner- Born around 1850 the son of Wolfgang Leithner Jr. he followed the gun makers trade until 1905 when he became the Bürgermeister of Ischl. Johann Von Lidl took over his business. He served as Bürgermeister until 1919.